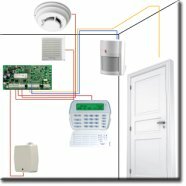 How alarm systems work depends on what they are doing. Some are fully electronic and will react to heat, while others react to motion, and still others may react to both or to a minute movement. Home alarm systems offer various ways in which to alert you to the presence of fire, smoke, burglars, even to a window that may be ajar in your home. Home Alarm systems are designed to tell you if your home has been subject to some type of intrusion. It does so by offering you an alarm and in some cases triggering a silent alarm that is sent to a police station or a fire department, or other appropriate emergency service. Heat sensors offer you a warning about fire, while flame or smoke sensors will trigger other types of warnings that will also set your alarm off. Most good alarm systems include heat, smoke, flame, motion and other types of sensors. These are typically wired, but may also be wireless. The breaking of a beam or the interruption of a connection in security alarms will trigger an alarm that is sent to your alarm monitoring company, or may simply begin a chain of phone calls. In either case, someone is alerted automatically when your home alarm systems go off. In the case of fire, flame or heat sensors detect the heat from the fire and sound a loud alarm that is designed to awaken or to alert you. The alarm will sound until it is manually shut off in most cases. The same is true of the security alarm. Until someone manually resets the alarm system, the alarm will not cease to make noise so that someone is alerted to the problem. Breaking a circuit, triggering a heat sensor, or introducing smoke into the alarm system are how these alarms actually operate, but how effective are they? Burglar alarms are considered to be one of the most effective safety devices in prevention of home intrusion. Fire and smoke alarms have been determined to be one of the most effective life saving devices that have ever been invented and introduced. Fire and smoke alarms as part of your home alarm systems can not only save your home, but they can save your life. A home alarm system is the single biggest deterrent to home burglaries and home alarm systems that include a fire alarm save lives every single day. Is there anything at all that could possibly be more important in the overall home ownership responsibility?